This is the oldest breed on the American continent and the smallest breed in the world .The <?xml:namespace prefix = st1 ns = "urn:schemas-microsoft-com:office:smarttags" />Chihuahua is named after the Mexican state of Chihuahua where he was brought to the rest of the world by travelers. This dog had its name after the American archeologist had found an image of a dog carved on the stone in the palace of Montezuma, the Aztec ruler. Who might be an ancestor of Chihuahua? Companion of the ancient Toltecs, is believed to be the progenitor of the Chihuahua. They distantly resembled ancestors of pug-dogs from East-Asia-China. ,from these places settlers directed to America across the Bering Strait. Approximately 10-11 thousand years ago people reached the south point of America and dogs are believed to come with them. But there is the theory that they might have come this way from America to Asia. Besides, American scientist William Web in a single dig on the Indian hill situated in the state Kentucky, found 21 small dogs interred in graves . Finding is dated 3000 year BC. This fact provides evidence that dogs were domesticated in North America long before they could possibly have arrived on Chinese ships making port in Maxico. There is another theory that techichi might be ancestors of hairless Mexican dog . But this fact is denied because of anatomical distinctions. The rectangular head shape of all hairless dogs is absolutely unlike the rounded head of Chihuahua. Hairless-type dogs have long ,round, ,whippy tails whereas the Chihuahua has flattened ,stif, furry tail. The long claw-like feet of the early Chihuahua are not seen in any other breed. Chochon .Dogs were used not for edible interests but for religious ceremonies. In 1519 after the victory of conquistadors under Kortes in Mexico the Aztec empire was defeated. Possibly, during the battles ancient dogs were killed too, their bones were found in the burial places .Mummies of dogs are met together with human’s burials . Their pictures can be seen on the walls of temples and tombs. The earliest evidence of existence of this dogs are believed to be pictures of little dogs carved in the stones in the monastery Orotsingo between Mexico and Pueblo. A pottery dog figures and carvings were used for some mystic purpose in connection with temple or home worship. Other account relate that dogs were sacrificed in the belief that sins of the human would be transferred to the dog , so that the human could gain safe passage to the other world ,and this dog will follow the master helping him overcome all difficulties of hell’s darkness . However , we don’t have to identify ancient dogs with modern Chihuahua . According to the ancient pictures , dogs in the past had elongated heads, unlike their modern dogs with apple-shape head ,their muzzles were longer, but ears mostly very large. Some dogs-lovers always tend to think that their favourite breed is the most ancient and puriest. As for Chihuahua , some impartial researchers are convinced that formation of modern type of breed was under influence of other miniature breeds –toy-terriers miniature pinscher , spitz. The first record of the Chihuahua, as a breed , occurred about 1884 when Mexicans began selling these dogs to people in the border markets . 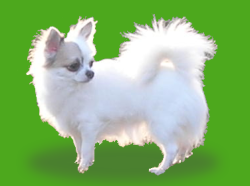 The American Kennel Club first registered the Chihuahua as a breed in 1904. It was short-haired male-dog Midget who entered the American Kennel Club stud book in 1904 along with three others In 1915 this breed was voted in the USA. The Chihuahua Club of America was established in 1923 .At the beginning , short-haired dogs were given preference, but later long-haired dogs appeared. Until 1952 these two varieties were demonstrated at the same level , but after 1952 year this breed was split into two varieties .The two are judged on the same standards ,the difference is that one variety is short-haired and the other is long –haired. They are still interbred in the States, resulting in both coat varieties in the same litter .In 1954 in the USA 24 ,000 Chihuahua were registered .By 1970 that number jumped to 25,000. The breed began to move into England from the United States and directly from Mexico in 1897 . .In 1907 a Chihuahua was formally exhibited at Ladies Kennel Club Show. Then registration privileges followed. On the Kraft show in 1937 a Chihuahua was exhibited for the first time ./ 7 dogs and three of them –from America/ All participants were short-haired variety of this breed. By 1949, there remained only eight registered dogs, and there was no pre-war breeding left in England. By1953, the number of registered Chihuahua was 111. Again a Chihuahua appeared on the Kraft Show only in 1951. This breed began to move to Europe supposedly in 1950s.-in Germany and France. The Chihuahua is consider to be their dearly-beloved national breed .And the dearest guests are given these little dogs as a present.